We all took the bus together last Thursday to the Anthony's first-grade entrance ceremony. 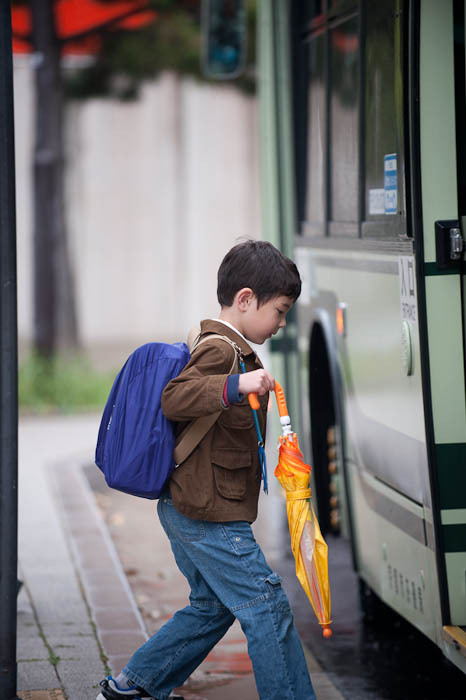 On Friday, his first day of school, I rode the bus with him. On Monday (yesterday), he rode the bus himself while I followed along on the scooter “just in case”, as we had practiced during spring break. Today he went on the bus all by himself. Wow, does that tug! 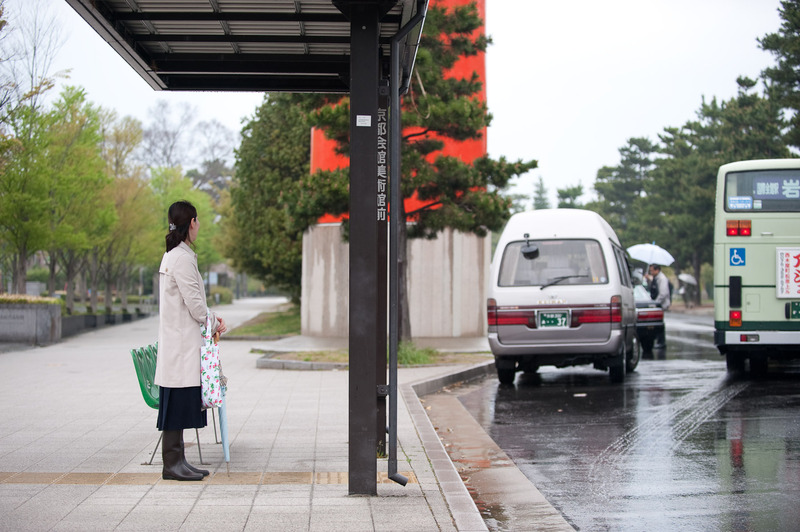 Especially the photo of Fumie watching the bus pull away. I always enjoy your posts, plug-ins, and the perspective you bring to your home life. This post is very emotive and personal. Thank you for sharing. Pretty nice shot of your wife. A big step of your son, a wonderful moment of your life! I have to agree about the shot of Fumie watching the bus pull away. Tugs at a parents heart strings. But of course, that’s what we raise them to do. It just doesn’t make it easier when it happens. Nice shots. I have to agree about the wistful picture of Mommy. Even without seeing her face, we can feel it. Just checked the metadata for the time the shot was taken (7:09 a.m.), to see if Anthony might be passing our place (bus 5 stops right in front of our building) around the time Greg gets on his kindergarten bus. Looks like Anthony is probably going by as Greg eats breakfast. Elementary school is the big leagues. I also checked for Anthony as three (!) buses went b while I was waiting for Greg’s homeward bus (2:35- 3:05), but didn’t see him. I love this picture, if I where Fumie I would be in- “un mar de lagrimas” – as we say in spanish wich means -“in a sea made of tears”-. Beautiful, beautifl, Thank you for share this moments!